Dimensions 1 by 5.50 by 8.25 in. Mass media; United States; Forecasting. Fresh from the first 10 billion election campaign, two award-winning authors show how unbridled campaign spending defines our politics and, failing a dramatic intervention, signals the end of our democracy. Blending vivid reporting from the 2012 campaign trail and deep perspective from decades covering American and international media and politics, political journalist John Nichols and media critic Robert W. McChesney explain how US elections are becoming controlled, predictable enterprises that are managed by a new class of consultants who wield millions of dollars and define our politics as never before. As the money gets biggerÂespecially after the Citizens United rulingÂand journalism, a core check and balance on the government, declines, American citizens are in danger of becoming less informed and more open to manipulation. 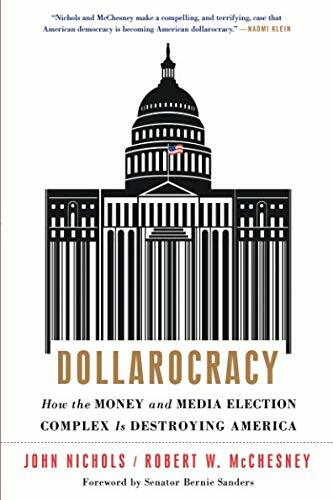 With groundbreaking behind-the-scenes reporting and staggering new research on Âthe money power,â Dollarocracy shows that this new power does not just endanger electoral politics; it is a challenge to the DNA of American democracy itself. About: Fresh from the first 10 billion election campaign, two award-winning authors show how unbridled campaign spending defines our politics and, failing a dramatic intervention, signals the end of our democracy. About: Foreword by Senator Bernie SandersFresh from the first 10 billion election campaign, two award-winning authors show how unbridled campaign spending defines our politics and, failing a dramatic intervention, signals the end of our democracy.